Color illustration shows Takeda commander charging through a gap in the wooden fences. Turnbull identifies him as "Obata Masamori (also called Nobusada)". Aren't they actually two different persons? Wikipedia also identifies Masamori and Nobusada as one and the same. Did Dr. Turnbull contradict himself? In the Samurai Sourcebook he lists Masamori and Nobusada as two different people. My research shows that the illustration in question in Turnbull's Nagashino book has another error. The Takeda commander is illustrated as wearing the armour of Obata Nobusada of Kozuke while flying the flags of Obata Masamori of Kai. Below is how I've sorted them out. the Japanese wiki lists them as two seperate people. 小幡昌盛 小幡信貞It says Nobusade was originally from Kozuke, but then served the Takeda. Turnbull's Samurai Sourcebook bios are almost completely lifted verbatim (and uncredited, I will add) out of Papinot's "Historical and Geographical Dictionary of Japan"-so his secondary source was about 90 years old already when SS was printed. Really, using anything Turnbull wrote before 2005 or so as a source is done so at your own risk. He's been much better since then but looks to have retired (I had a couple of research jobs come my way when Turnbull turned them down). And of course, the Wikipedia entry is based on the Samurai Sourcebook (since Kitsuno spent hours having all the Wikipedia bios that were stolen from the Samurai Archives purged). J-Wiki is usually pretty good, but English language Wiki is still awful for pre-modern J-History. But you cannot blame this case on Papinot's Historical and Geographical Dictionary of Japan. Anyway, Evalerio, sorry for derailing your thread . That's all right. I am apprehensive as there are more that I have to ask about. Ask away. I'm the one who derailed the thread, and for that I apologize. But that's what this site is for--discussion. No one's got a problem with you and your questions. Just shoddy research and writing. Edit: I split the off-topic posts into another thread. Ask away, though remembering the answer to your questions of "Why is Turnbull inconsistent?" may just be "Well, he's Turnbull...when you copy and paste 1000 things, sometimes you make mistakes..."
Trying to keep track of the changing of names as an individual progresses is confusing. This is in regards to Kosaka Danjo Masanobu as he is depicted in the Taiga series 'Fuurin Kazan'. As a heraldry buff, this is one of my favorites. Most Taiga drama often take liberties or artistic license to 'tweak' heraldry, to make them more colorful and stand out. The background detail in 'Fuurin Kazan' is amazing as the heraldry evolves as the person evolves. A.) In 'Fuurin Kazan' Kasuga Toratsuna is in charge of Maki Castle 1553. He flies green Kasuga flags with a Kiku (Chrysanthemum) crest. The Kasuga sashimono can be seen in the Kawanakajima Screens among the ranks of the Saijosan force. B.) With Toratsuna is a certain Kosaka Chikuzen who is very impressed with the young Toratsuna. In Terje Sollum's books, the Kosaka of Shinano are often mentioned. The Kosaka crest is a hoshi (star). C.) Nearing the 4th Battle of Kawanakajima Toratsuna is now called Kosaka Danjo, adopted(?) by the Kosaka of Shinano? In Kaizu Castle Danjo flies new flags of white Kosaka hoshi on green Kasuga flags. D.) Today in most Japanese festivals, parades and the Kawanakajima reenactments. Kosaka Masanobu is represented by yellow flags. Is this the final version? Many flags in today's festivals and in Dr. Turnbull's books flags are often anachronistic, In film and TV, the final version being flown by individuals early on or throughout their career. To add to the confusion an RK book on Nagashino has Kosaka Masanobu with a light yellow flag with NO mon at all. I'm assuming festival organizers and filmmakers can't have a plain yellow flag and kept the Kosaka mon? Are any of the detail I mentioned from the series pure fiction or based on history? Can't help you with anything else, but this is fascinating, as Kosaka Masanobu wasn't AT Nagashino. He was in charge of 10,000--15,000 troops holding the northern borders in Shinano against the Uesugi, protecting Katsuyori's rear (Obenjo joke goes here) while Katsuyori moved against the Tokugawa. His younger brother (I think) WAS at Nagashino (and died), but his name escapes me at the moment, and I'm not able to look it up just this second. You are right, sir. I don't think the book was saying that Masanobu was at Nagashino. The book was listing the names of Takeda generals, with their corresponding heraldry. 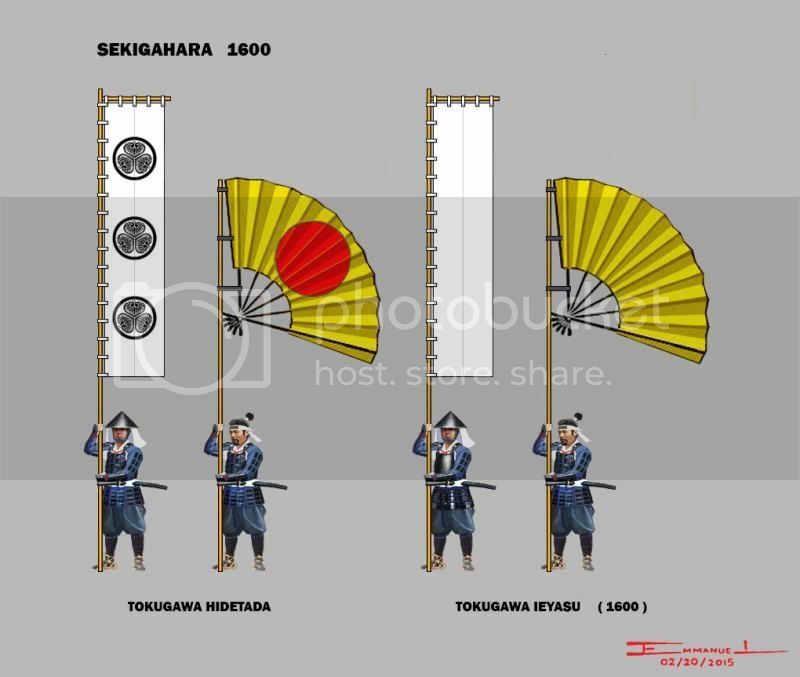 All the other Takeda generals had flags I was familiar with. Masanobu was the sole exception. Masanobu's younger brother being at Nagashino, and Masanobu flying plain flags makes me wonder about Ieyasu at Sekigahara. Ieyasu gave Hidetada THE Tokugawa nobori. Ieyasu displayed plain white flags without mon as replacements. Ah, okay, that makes sense. Since it was in a book on Nagashino, I read it as saying Masanobu was at Nagashino. Is the "star" crest just "hoshi　星"? No modifiers? Are there other "star" crests? There are some similar crests, the "Nine Lights" crests http://ja.wikipedia.org/wiki/%E4%B9%9D%E6%9B%9C (bottom of page), as the Hosokawa crest, but the central circle is only slightly larger than the others. Is this mixed up? I though Hidetada did not get to Sekigahara on time. According to the J-wiki, it was Masanobu's son and heir Masazumi 昌澄 that was killed. There are some similar crests, the "Nine Lights" crests (bottom of page), as the Hosokawa crest, but the central circle is only slightly larger than the others. 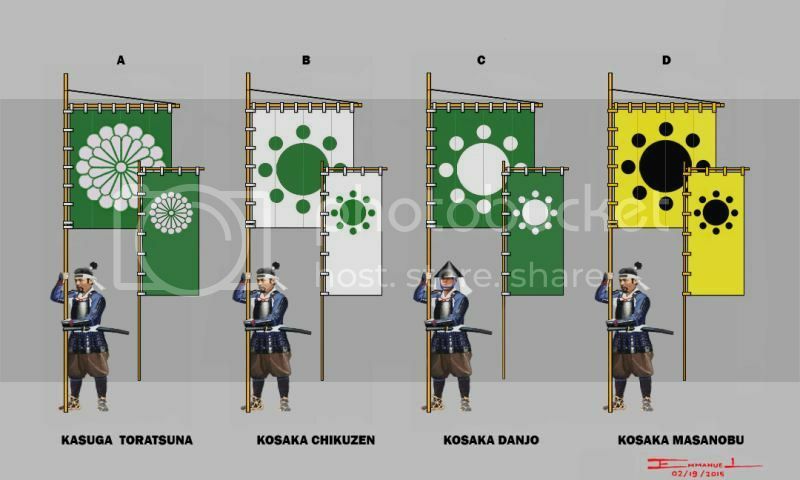 The Hosokawa crest is the middle one, but which is the Chiba crest? Under the 'star' crest are dozens of variations with specific names describing each design. I have yet to translate the names I need. Why I started the other thread regarding the names for specific crest designs. Hidetada did not make it on time. I was comparing the possibility that Kosaka Masanobu may have done the same thing as Ieyasu did. The Father handing down his more colorful personal standards and banners to his heir (Masazumi it is), and replacing his own with plain ones. The Chiba and Hosokawa use the same type of hoshi crest. The Kosaka have smaller satellites in orbit. That does make sense-- the 48-year old Masanobu giving his heir his own banners while he protected the home front. But I was wondering about Ieyasu. Did he give Hidetada his own banners before he left Edo, then? The Chiba and Hosokawa use the same type of hoshi crest. Then I accept Tatsunoshi's correction. 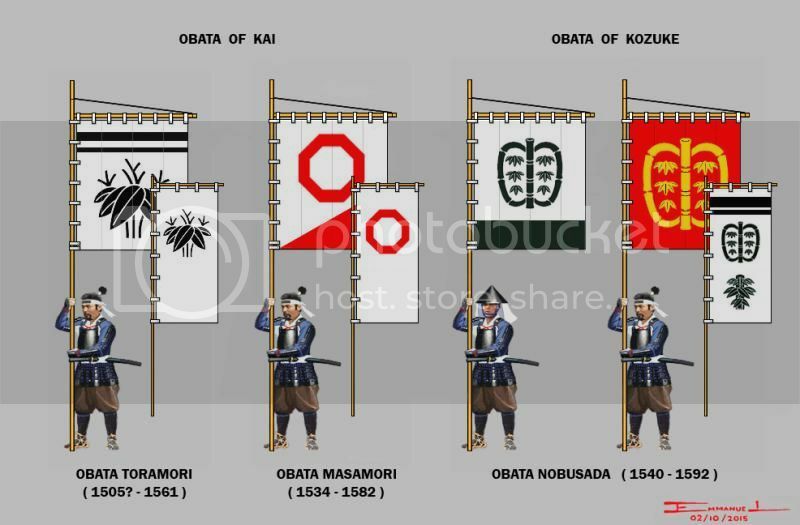 Ieyasu gave Hidetada the banners when Hidetada left to command the army. The banners were with him when he got held up by the Sanada. Ieyasu was really in command. I can only imagine how he felt about it. Commanding one of the largest army ever, with some of the greatest generals fighting for him. His son late for the show with his prized banners. Ieyasu in his HQ with plain white. Ieyasu had a plain gold fan. It was Hidetada who used one with a red disc.